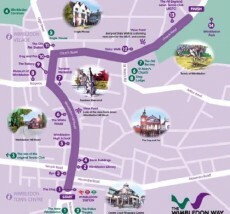 If you’re looking for something to do in the school half term – why not think about exploring Wimbledon. Pick up The Wimbledon Way leaflet and Family Trail flier from the Information Point in Centre Court, or from Wimbledon Library, and find out a bit more about Wimbledon’s fascinating heritage. Or you can download the Family Trail flier here. Common Ground celebrates the unique story of how a patch of land changed sporting history with Wimbledon Common becoming a catalyst for the birth of so many sports and the breeding ground for sporting champions. The film explores Wimbledon, traveling from the Ice Age into the Victorian era and right up to the present day. Illustrating how a number of extraordinary factors resulted in the creation of so many of the world’s most popular sports.